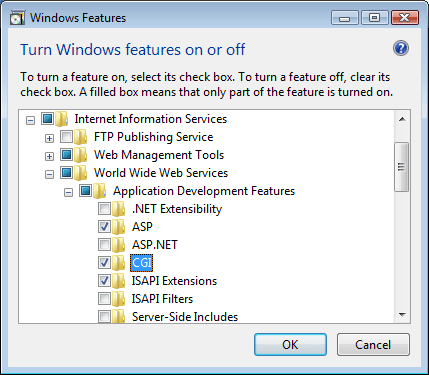 The <cgi> element configures default settings for Common Gateway Interface (CGI) applications for Internet Information Services (IIS) 7. 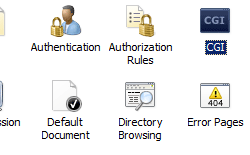 These settings define the environment that IIS 7 will use when launching CGI processes. 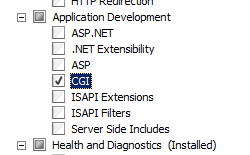 For example, the createCGIWithNewConsole and createProcessAsUser attributes specify how IIS 7 will launch a CGI application, and the timeout attribute specifies how long IIS will let a CGI application run before terminating the process. CGI is sometimes considered to be a legacy application environment. Because of the processing overhead that is associated with launching CGI applications as separate processes, technologies like HTTP Modules, ISAPI extensions, ASP/ASP.NET, and FastCGI are preferred over CGI for application development. 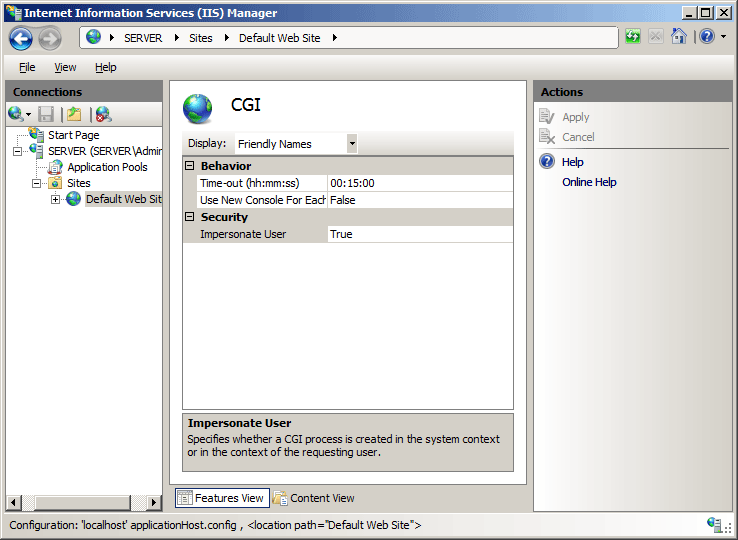 The CGI environment is not installed by default; however, installing the CGI environment also installs the necessary functionality for using FastCGI applications. 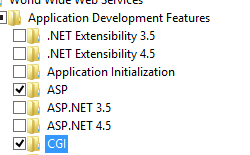 For more information about using FastCGI on IIS 7, see the <fastCgi> element. IIS 10.0 The <cgi> element was not modified in IIS 10.0. IIS 8.5 The <cgi> element was not modified in IIS 8.5. 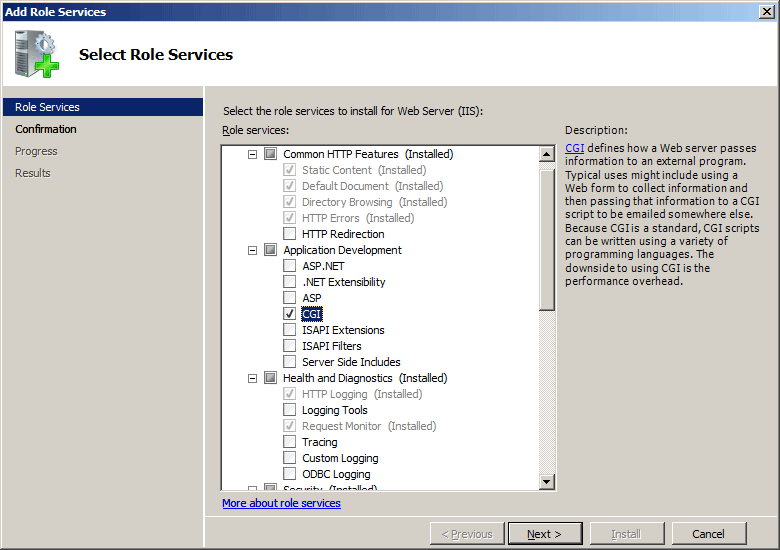 IIS 8.0 The <cgi> element was not modified in IIS 8.0. 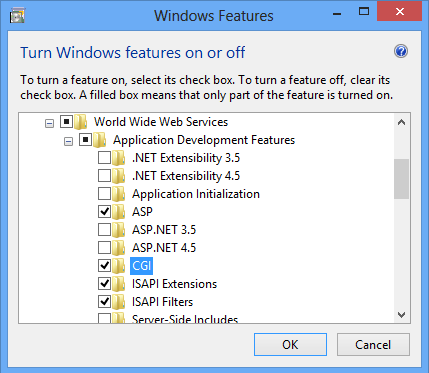 IIS 7.5 The <cgi> element was not modified in IIS 7.5. IIS 7.0 The <cgi> element was introduced in IIS 7.0. 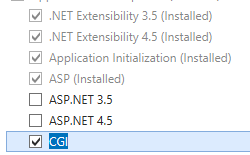 IIS 6.0 The attributes for the <cgi> element replaces the IIS 6.0 following metabase properties: CreateProcessAsUser, CreateCGIWithNewConsole, and CGITimeout. 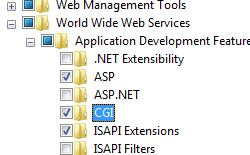 The <cgi> element is not included in the default installation of IIS 7 and later.To use the CGI environment, you must first install the CGI role service. The installation process registers the Common Gateway Interface (CGI) role service in both the <globalModules> and <modules> element. 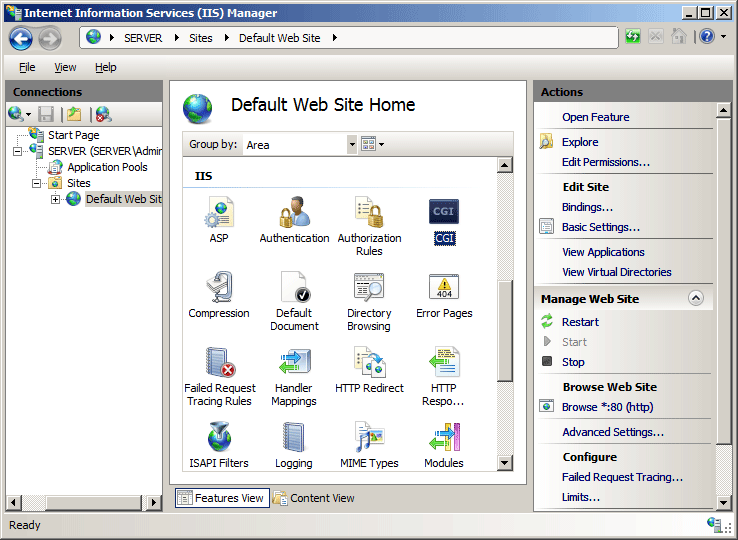 In the Connections pane, expand the server name, expand Sites, and then navigate to the Web site or Web application that you want to configure. In the site or application Home pane, double-click CGI. 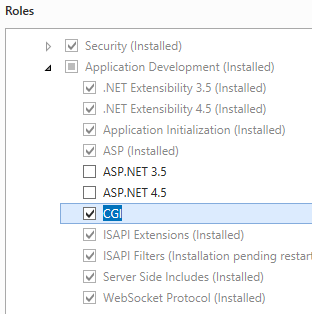 In the CGI pane, configure the required settings, and then click Apply in the Actions pane. Specifies whether a CGI application runs in its own console. Note: If the value is set to true, each CGI application creates a new console when the application is started. A value of false indicates that CGI applications should run without a console. Specifies whether a CGI process is created in the system context or in the context of the requesting user. Specifies the time-out for a CGI application. 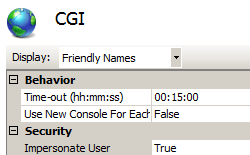 The following configuration sample specifies that each CGI application creates a new console when the application starts, that CGI processes be created in the context of the requesting user, and that the time-out for CGI applications is 20 minutes.